However, times have changed, and Apple has come very, very far from the sad iMacs and hockey puck mice of my high school days. Also, my laptop was in definite need of replacement, so I decided to go and get a new Macbook Pro. I also wanted to try my hand at iOS app development. I’ve played around briefly with other people’s Macs, and was suitably impressed with the mouse gestures and retina display, but I had no idea about how it like to work with day to day. So, here are my initial thoughts and experiences. Cut and Paste of Files is Missing? I noticed that there was nothing in the context menu to “Cut” files. I could Copy and Paste them, sure, and I could drag them around, but no actual “Cut.” A friend informed me that there’s a hot key, cmd+option+v (Copy and Move), but no corresponding gui option. Why? I have no idea, but it’s slightly annoying. No way to sort first by folders or files, and then alphabetically. I noticed this the first time I played with a Mac, but you can’t sort things by my preferred method, by files or folders, and then each group alphabetically. You can sort by “kind,” but that doesn’t quite do the trick – because all the files are then sorted by kind, as well. There doesn’t seem to be a workaround at this time. I make frequent use of the “create new text file,” in Windows, using it to create new empty files on the fly, changing the extension to the desired file type. Sadly, there’s no equivalent in OS X. Putting the computer to sleep and waking it up is seamless, and the retina display is gorgeous. Mouse gestures are great and speed things up considerably. I can feel it venting heat from the keys! My fingers can literally be on fire. Magento Enterprise Edition (EE) is essentially an extension of the Community Edition (CE). Enterprise Edition is a superset of the features of the Community Edition. That is, there no features in Community Edition that aren’t also in Enterprise Edition. You can see that when you look at the folder tree. 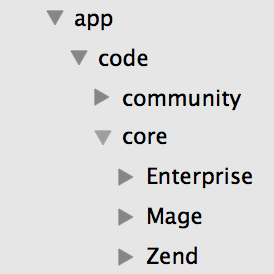 The core Magento files are located in app/code/core/Mage, while all Enterprise related features are in app/code/core/Enterprise. As such, you can roughly determine the corresponding CE edition based on your version of EE. Here’s a mapping, based on the release dates of each. It doesn’t cover the minor revisions in between, just major versions. I will attempt to keep this updated as new versions come out. As you can see, there is some overlap between the base Magento versions of EE 1.7-1.9, most likely because the Magento team were focusing their efforts on developing Enterprise Edition. The next parallel release was Magento CE 1.5 and EE 1.10, and they were kept pretty much in sync since then. I found such a mapping helpful when I was looking for bug fixes for the core Magento code. I could say, I’m running EE 1.x, and there’s a bug in the app/code/core/Mage directory, so I can find the information about the bug in the corresponding CE edition.